A woman has been injured by a letter bomb which exploded at the main DVLA centre in Swansea, the fourth mail blast incident in five days. The attack, at 0923 GMT, is the third of its kind on motoring-related companies this week. A Berkshire accountancy firm was hit on Tuesday, and the London congestion charge operator Capita on Monday. Police are also investigating a letter bomb which injured a man at his home in Folkestone, Kent, on Saturday. The specialist National Domestic Extremism Unit is trying to establish whether there is any connection between the three attacks on offices and the letter bomb received by the 53-year-old man, who suffered minor injuries. The woman injured in the post room of the Driver and Vehicle Licensing Agency was involved in "a small letter-type explosion", South Wales Police said. Morriston Hospital, where the woman was taken, said in a statement she was in a stable condition. Are they trying to draw attention to a cause, are they or is he or is she just a very disgruntled motorist? "She is undergoing treatment at the present time and has been assessed by a consultant," the statement said. 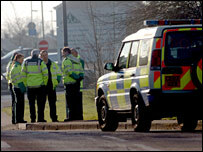 A cordon has been put in place around the scene of the DVLA blast and access roads have been closed. But police said the building and surrounding areas had not been evacuated so far. On Tuesday a package exploded at the Berkshire offices of an accountancy firm linked to Speed Check Services, based in Camberley, Surrey, the provider of digital speed cameras to the police. That followed a letter bomb attack the day before at the central London offices of Capita. Peter Power, a former senior officer at Scotland Yard, told the BBC the police would be looking at whether a "disgruntled" motorist could be behind the attacks. "I've got no doubt whatsoever that the police are desperately trying to think about who the perpetrators might be," he said. "Are they trying to draw attention to a cause, are they or is he or is she just a very disgruntled motorist? So there is some connection and the police I'm sure will be trying to find that out." Nigel Humphries, from the Association of British Drivers, told BBC Radio Five Live he was "appalled" by the apparent bombing campaign. He added: "In fact, it makes us feel a bit guilty that we haven't campaigned hard enough on the legitimate front against the things that we oppose, to do with criminalising and bullying motorists and because of our failure to campaign hard enough, somebody's had to resort to this." Home Secretary John Reid described the incidents as "worrying". But he added: "It is important we allow police to get on with their investigation without undue speculation." The Public and Commercial Services Union, which represents workers at the DVLA, has called for an urgent security review following the incident. Jeff Evans, the union's senior officer for Wales, said: "We now want a proper risk assessment on the position at DVLA offices across the country." In a separate incident on Wednesday, a controlled explosion was carried out on a package found on a road in Havant, Hampshire. Police said they were not linking this with the other four letter bombs. Letter bomb campaign was triggered by a hatred of "surveillance society"